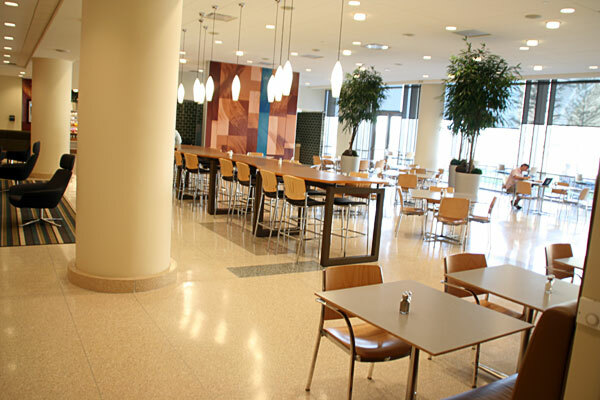 Located on the main floor of Eckstein Hall, Tory Hill Cafe has breakfast, lunch and dinner offerings with the added bonus of an espresso bar that serves up exceptional lattes and mochas. Breakfast highlights include egg skillets, French toast, egg sandwiches, baked oatmeal, crepes and other assorted fresh bakery. Lunch features popular items such as paninis, fresh cafe sandwiches, salads and homemade soups. For the evening crowd, Tory Hill Cafe offers special dinner entrees including pesto chicken risotto and baked macaroni & cheese. Guests of Tory Hill Cafe can cozy up next to the fireplace in the dining area or take their items to go. Outdoor seating is available seasonally as well.